Cohort Two companies spent the week of June 10, 2018 in DC where the founders focused on connecting with campaigns, consultancies, and unions and helping arm them with the best tools to win in November. Throughout the week we were fortunate to be hosted at Smoot Tewes Group and sponsored by Catalist. Ron Klain, Chairman of the Advisory Board, welcomed our founders to DC and helped introduce their new tools to progressive leaders in DC. From there, we were lucky to go in depth on tech development and data. Robby Mook joined us for a thoughtful session where he introduced us to his bipartisan work to improve campaigns’ cyber security. Robby gave the companies first-hand perspective on what it is like to build technology for a presidential campaign and what lessons he learned in doing so. A highlight of Robby’s session included a back-and-forth between the companies and Robby on how data is managed in the party. Laura Quinn, CEO of Catalist Data, helped us go deeper in understanding data. All the founders were enamored by Laura’s talk on Democratic Data and the Electorate. Laura helped us understand not only how the country has shifted but also how important our founders’ tools are for helping get us back on course! Most of the week was focused on connecting with potential buyers of political technology. The DNC hosted HGL and DLCC, DCCC, DSCC, DGA, DAGA for a political tech speed dating, where our companies had the opportunity to meet 1:1 with each committee. Chairman Perez, underscoring the importance the DNC is placing on new tech tools, joined us to kick of the session. The next morning, the AFL-CIO hosted labor unions and HGL for a session to learn about the companies. The dynamic session with the union leaders not only resulted in many potential partnerships, but also gave the founders important feedback on how they could build their tools to better serve unions. That afternoon, HGL welcome over 90 consultants, campaigns, and advocacy groups, to a political technology showcase where the founders pitched their products and the audience had the opportunity to follow up 1:1 with companies of interest. At the showcase, we were lucky to partner with Hustle to open a showcase-specific text line where audience members could provide real time feedback or ask to follow up with companies that interested them. After a big focus on building relationships with political tech buyers, the cohort turned its focus towards our San Francisco intensive and fundraising. 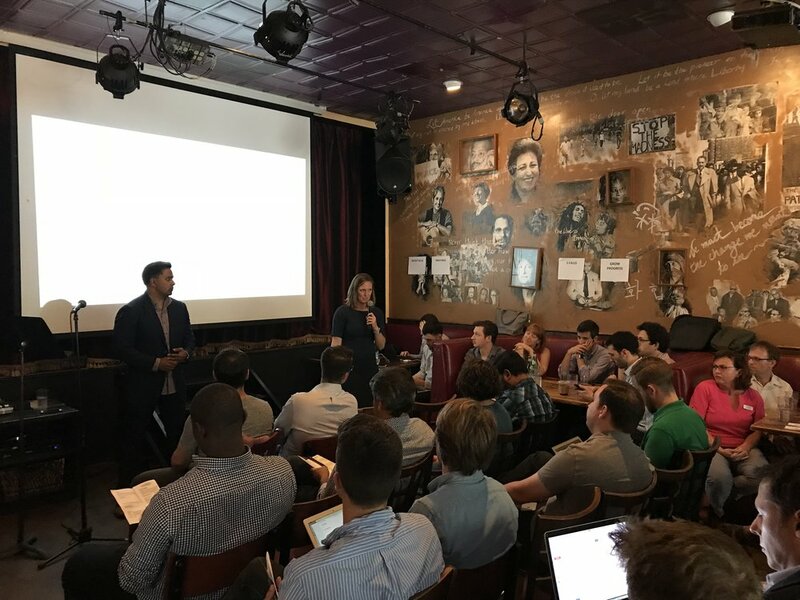 We were fortunate to be joined by Steph Spiers, Doba Parushev, Arun Gupta, Ryan Clinton, Richard Frankel, and Stephanie Valencia to help refine fundraising pitches and prepare to present in front of potential investors. The day also provided an opportunity to refine business models. Andrew – and a slate of talented coaches – helped the companies refine their business models. Before the companies left DC, we were treated to two inspiring talks. Robert Wolf, former President and COO of UBS Investment Bank gave founders insight on what he looks for in an investment opportunity. 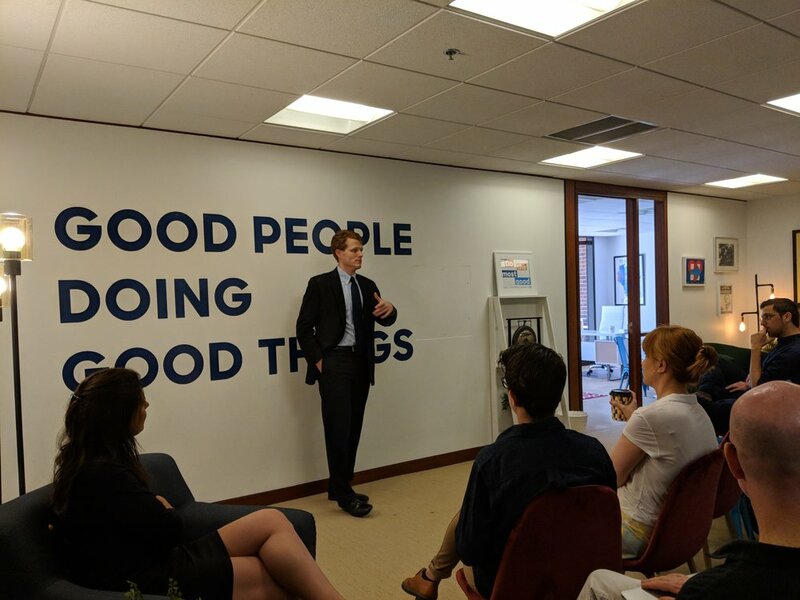 Rep. Joe Kennedy joined the companies to share his perspective on the midterm elections and what he is seeing when he campaigns for his colleagues across the country. While the intensive ended Thursday evening, many companies stayed in DC to follow up with connections they made that week. Next up – San Francisco and investor Demo Day!